I was a little hesitant I must say to join the “Open that Bottle Night” for our Wine Pairing Weekend event. I always have a hard time opening bottles that are special to me that I have brought back from Italy after visiting the wineries. I'll always have the memories from that visit, but once the bottle is gone it's gone. It's crazy thinking I know. I can go back and always get another bottle, but I'm sure many can relate that it can be tough. Another worry is after sitting on a bottle for years will it even be good upon opening it. 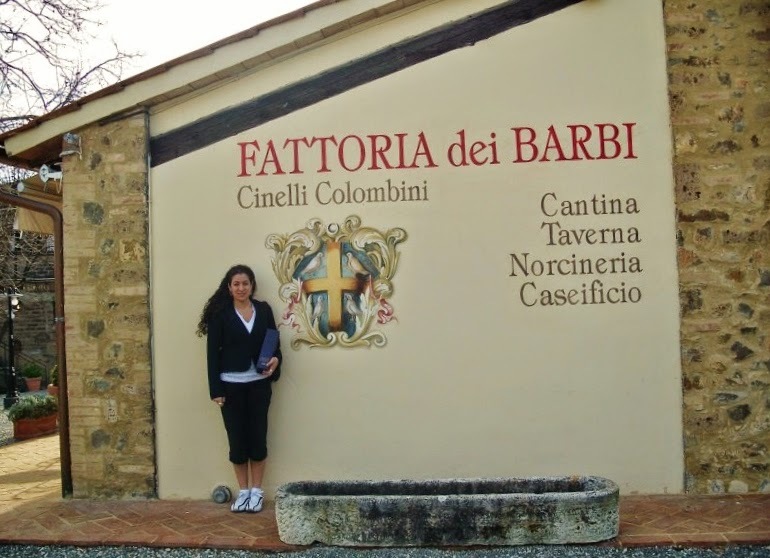 Well I decided to revisit a winery that I visited back in 2007, Fattoria dei Barbi in Montalcino within Tuscany. Fattoria dei Barbi is run today by Stefano Cinelli Colombini. The winery is on about 750 acres of land and their production is about 800,000 bottles with ¼ of those being Brunello di Montalcino. 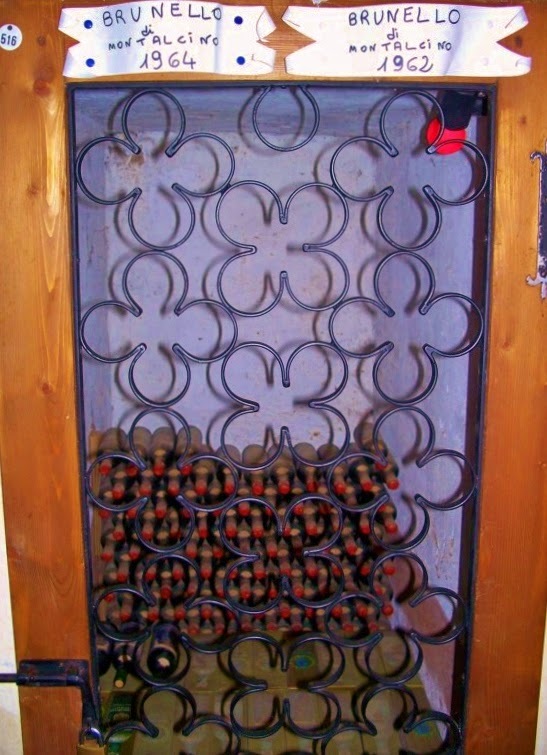 The winery still has bottles in their cellars bottles that date back to 1892. As you'll see from my pictures below there were bottles in dim red lighting from the 50's and 60's as well. I'd love to experience some of those older vintages to see how they have developed. One can dream. 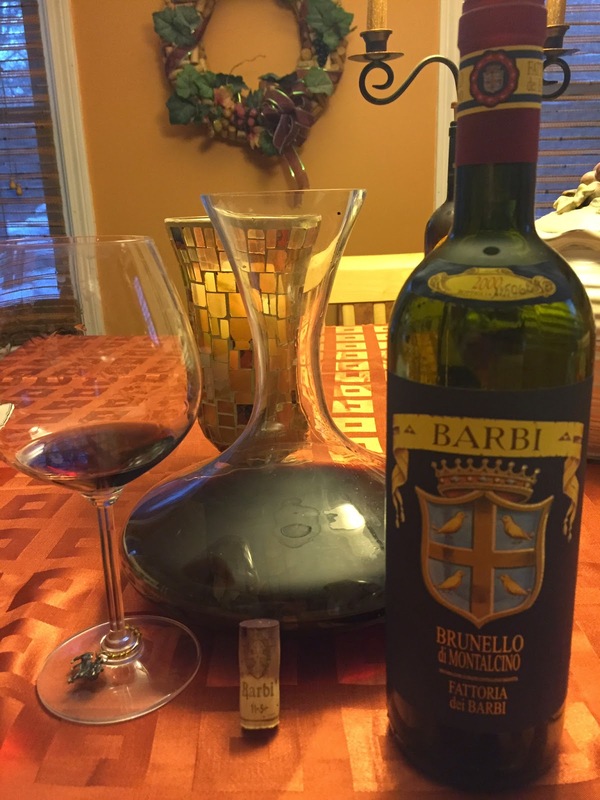 I was patiently aging a 2000 Fattoria dei Barbi Brunello di Montalcino that I chose to open to share with you today. If you're not too familiar with Brunello di Montalcino it was a DOCG that was created in Tuscany in 1980. 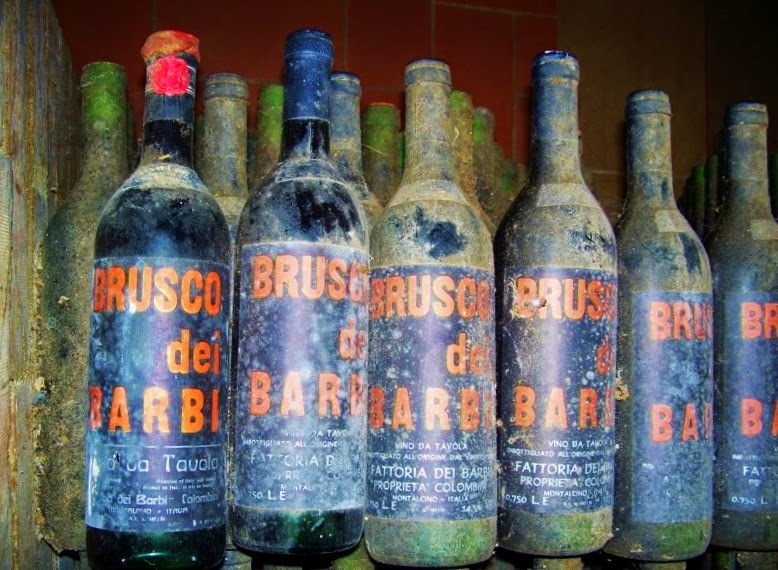 You may have heard of the 3 B's of Italian wines and that includes Barolo, Barbaresco and Brunello. These are some of the best wines in all of Italy. 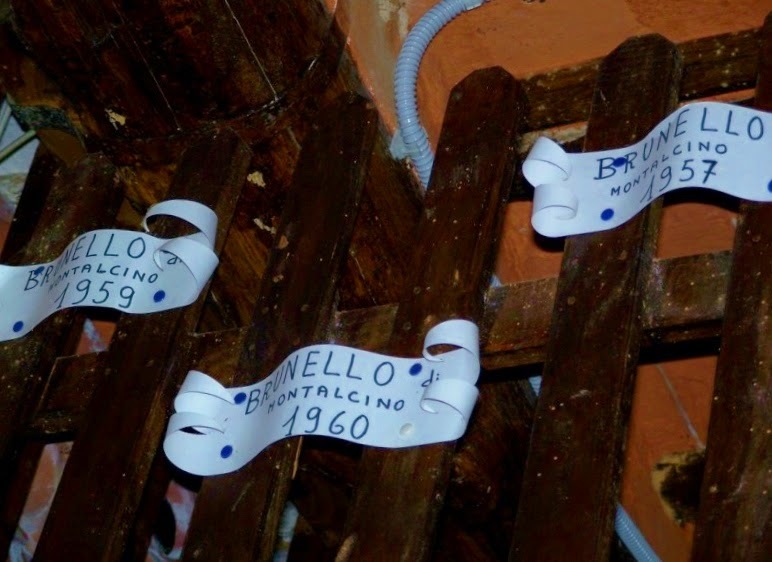 Sangiovese was definitely my first love when it came to Italian wine and as I began to discover how many clones of sangiovese there were back then and over time I discovered the amazing Brunello di Montalcino. This is a wine that is required by Italian law to be produced with 100% sangiovese grosso and to be aged a minimum of 2 years in barrel and 4 months in the bottle prior to release. 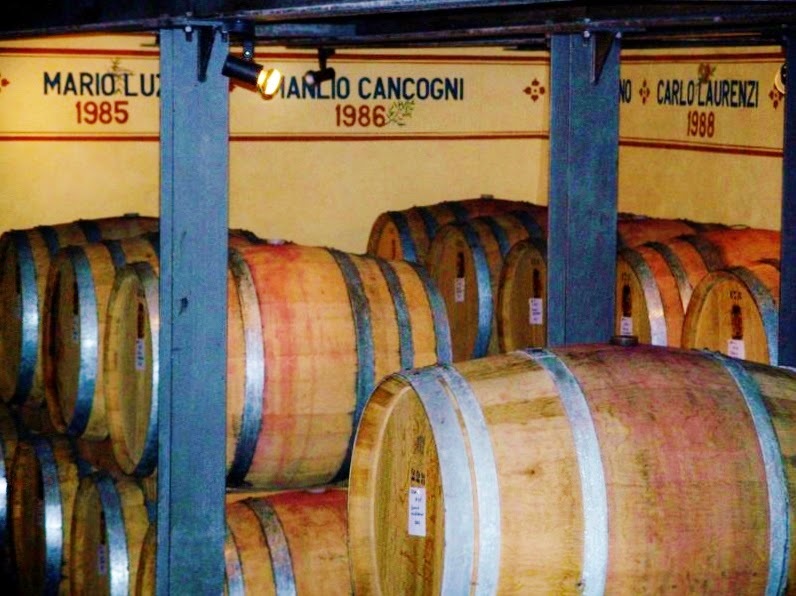 It's a wine that can age for 15-20+ years depending on the producer, storage conditions and the vintage itself. The long awaited moment had come where I opened and decanted my bottle of 2000 Fattoria dei Barbi Brunello di Montalcino. Obviously it doesn't compare to the vintages that I shared with you in the pictures above, but we can't have it all, can we? 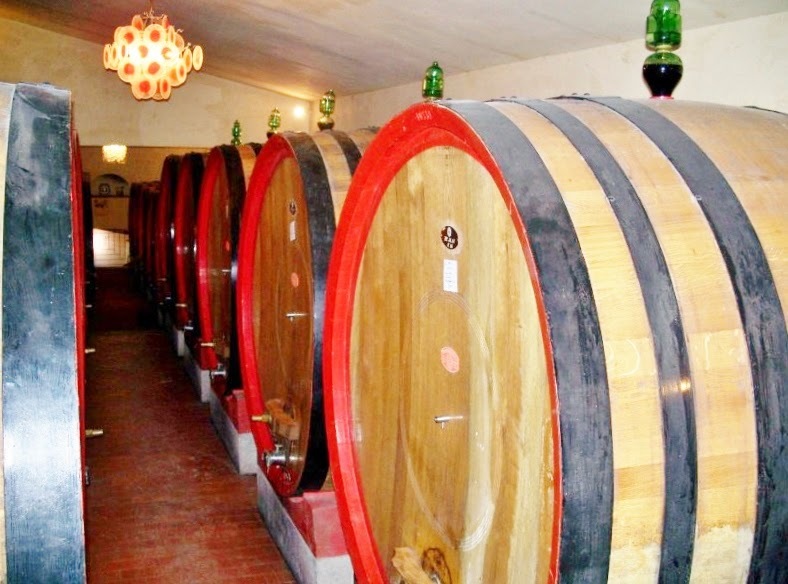 The Fattoria dei Barbi Brunello di Montalcino is aged 2 years in large slavonian oak barrels showed above followed by 4 months aging in the bottle. It's always amazing to me how a bottle with age can retain the characteristics they do when kept in the correct conditions. When I brought this bottle back from Italy I put it away in my wine fridge and never touched it again. Opening the bottle and pouring it into the decanter I then poured myself a few sips in anticipation to see how the bottle held up. I was impressed by the acidity and fruit that were still in tact. It was garnet in color with a slight hint of orange around the rim showing its age. After about close to an hour of the wine decanting everything was beautifully integrated and turned into a very silky, smooth and beautifully aromatic wine of ripe cherries, more on the black cherry side with a hint of tobacco. I sat there for awhile with my nose in the glass treasuring these moments as the nose was intense. If I had some of the foods that are accessible in Tuscany accessible here in the states I definitely would have chosen wild boar. It's one of my Tuscan favorites! 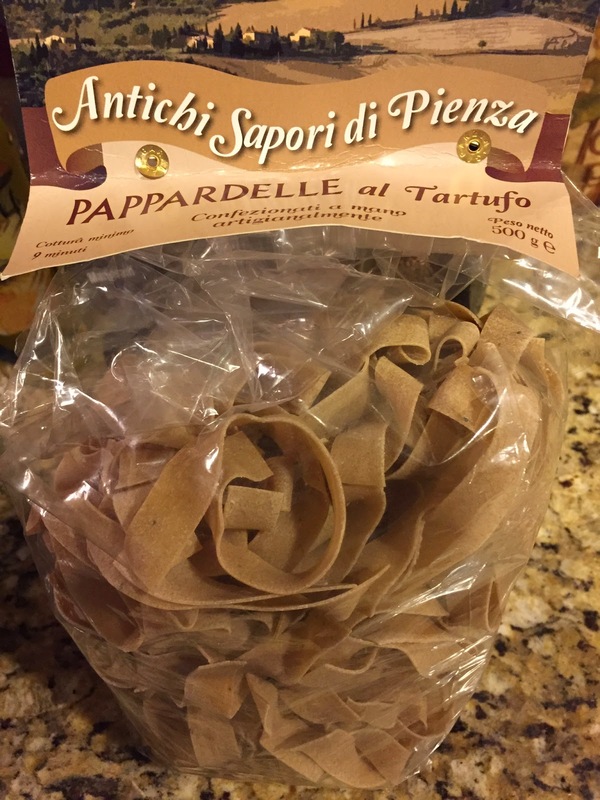 My husband is a lover of pappardelle and I promised I'd bring him some back from my recent trip to Italy. With this Brunello di Montalcino I prepared a pappardelle with bolognese sauce. You could also go for preparing it with braised beef as another option. One of the disappointing factors for me when I see pasta bolognese on a menu is whether or not it's produced in a true bolognese form. So many restaurants prepare it as an everyday meat sauce, but it's so much more. Every time I think of bolognese it brings me back to my travels to Bologna in the Emilia Romagna region during the same time when I also visited Fattoria dei Barbi. No one til this day has prepared a bolognese like that meal I experienced in Bologna, but it was coming from the source of Bologna so it's pretty hard to beat. 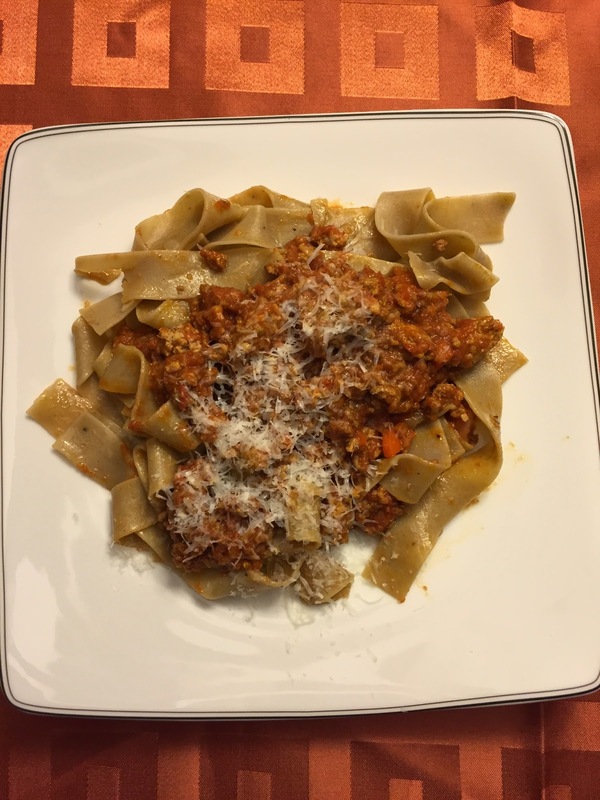 No one knows how to make a meal than those of where the dish originates from, except our group of course ; ) I decided to venture out and try preparing a different recipe for myself of a bolognese sauce and went with the recipe for Pappardelle with Bolognese Sauce from Williams Sonoma. I used a pappardelle with truffles that had a hint of flavor that was just enough to complement the dish. I topped the dish with an aged Tuscan pecorino, which is my favorite. 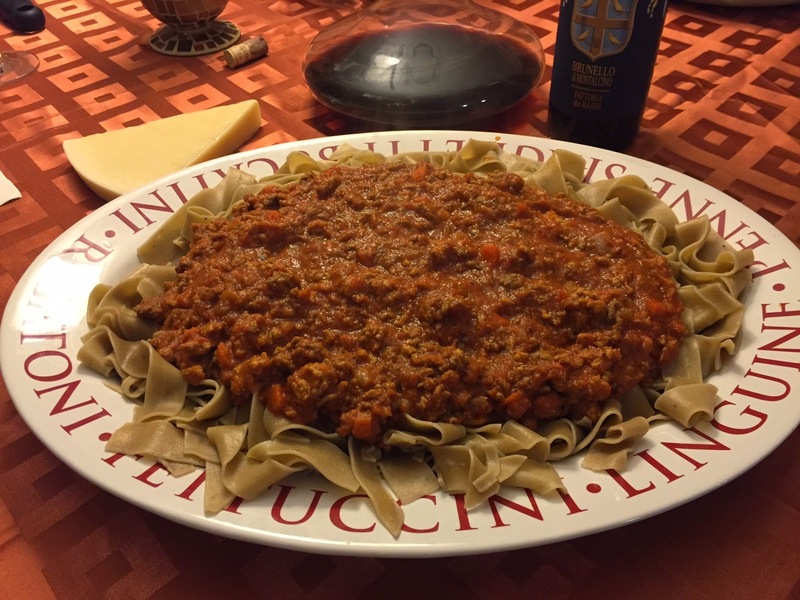 The elegance of the wine and the firm tannin combined with the rich bolognese sauce were a perfect combination. It was an evening of smiles and full bellies and was very delightful. Be sure to check out these special pairings from my fellow #winePW bloggers and their wonderful pairings for Open that Bottle Night! 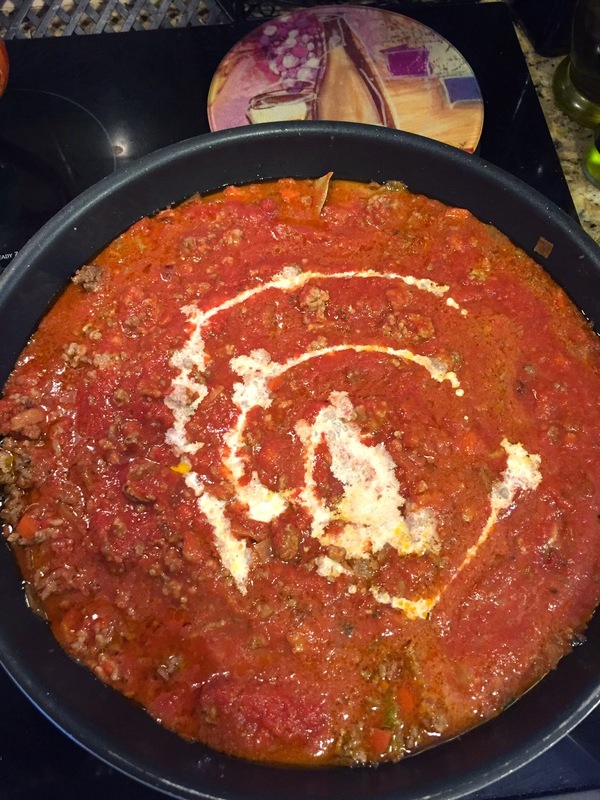 ENONFYLZ Wine Blog is sharing Friends, Food and Wine; An #OTBN To Remember #winePW.